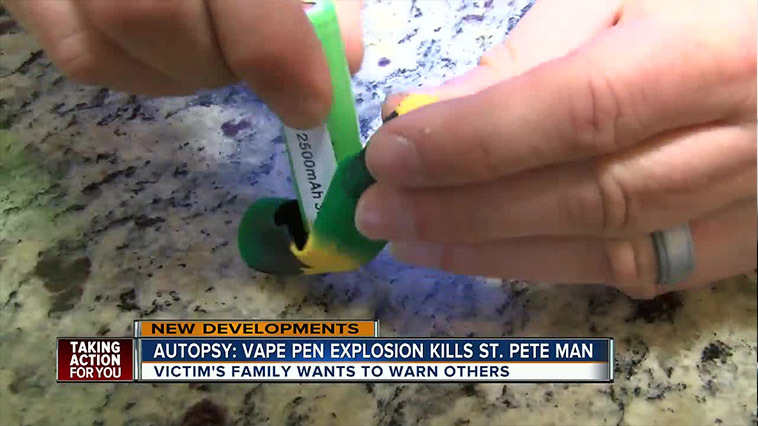 A St. Petersburg, Fla., man died recently because of an exploding vape device, the Pinellas County Medical Examiner’s Office confirmed Tuesday. Tallmadge Wakeman D’Elia, 38, died in a bedroom fire May 5, with burns covering more than 45 percent of his body. The autopsy report stated an exploding vape device caused a “projectile wound” to D’Elia’s head. Shrapnel entered D’Elia’s skull and brain, ABC Action News reported. The death is the first caused by an e-cigarette, according to FEMA, an industry tracker. Smoke-E Mountain Mech Works, an unregulated mechanical mod, was the device D’Elia was using at the time of his death, according to the medical examiner’s office. An online description of the device indicates it “does not come with safety features” and an online message warned it was not intended for novice vapers, ABC’s Tampa Bay affiliate reported. The autopsy report concluded D’Elia’s death was accidental and provided no explanation for the exploding vaping device. ABC Action News reached a Smok-E Mountain official and was told the device was not defective. Instead, the official theorized, the tragedy could have stemmed from an atomizer or battery maintenance. The representative said the company faced complaints regarding other brands cloning battery types, which reduces safety precautions. The official said Smok-K Mountain plans to conduct its own investigation into the incident. For more info on battery safety, check out our article with vaping battery safety tips.